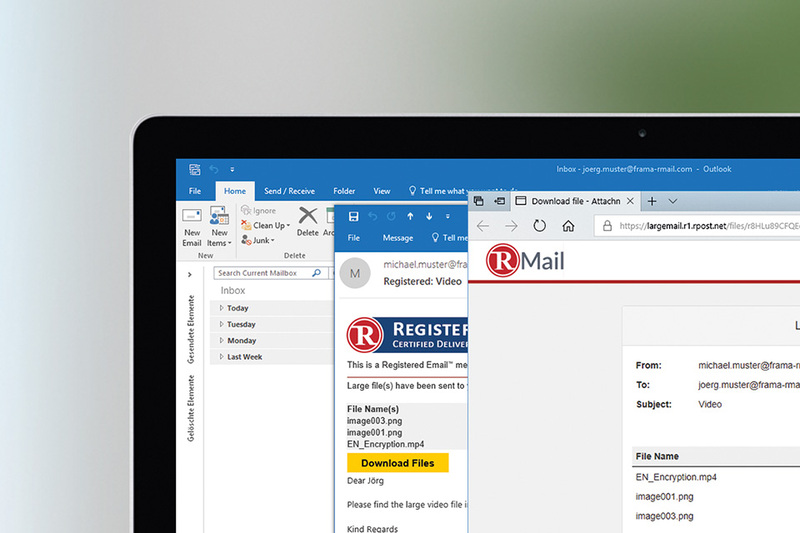 Optimise processes, comply with the latest directives and increase the credibility of your email communication with RMail. Where normal email ends, RMail begins: registered messages with proof of delivery and tracking, comparable to registered mail! Send files up to 1 GB directly from Outlook. No 3rd party portals and no forgotten files in any cloud! Electronic signing made easy. With eSignOff the confirmation of agreements, order assignments and "deals" is no longer an issue. It is not difficult to securely encrypt emails in order to protect personal and private data in the transfer, as required by the EU's General Data Protection Regulation (Art.5 §1f and Art.32 §1a). The challenge, however, is to make encryption as user-friendly as possible for the recipient, while demonstrating compliance with legislation in privacy audits. The Registered Receipt provides the facts: involved email addresses, timestamps, encryption methodology and delivery data including the server log files: thus the Registered Receipt becomes your "Compliance Record"! 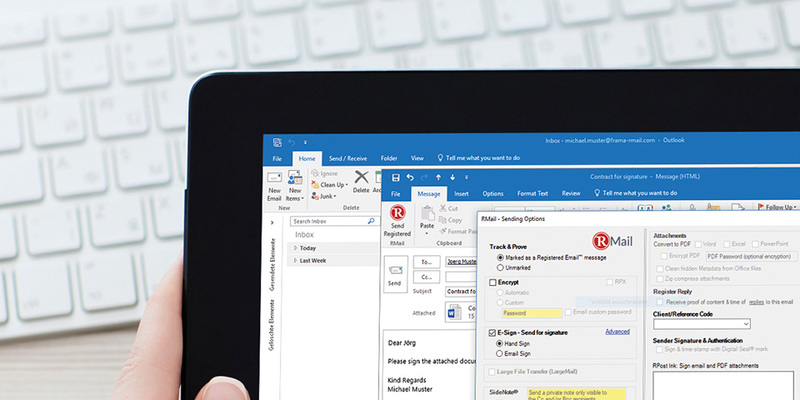 RMail ensures with auto-TLS encryption that confidential information remains confidential. Secure Reply allows recipients to respond encrypted regardless of the platform. Provide real value to your customers and state that the protection of personal information is important to you. 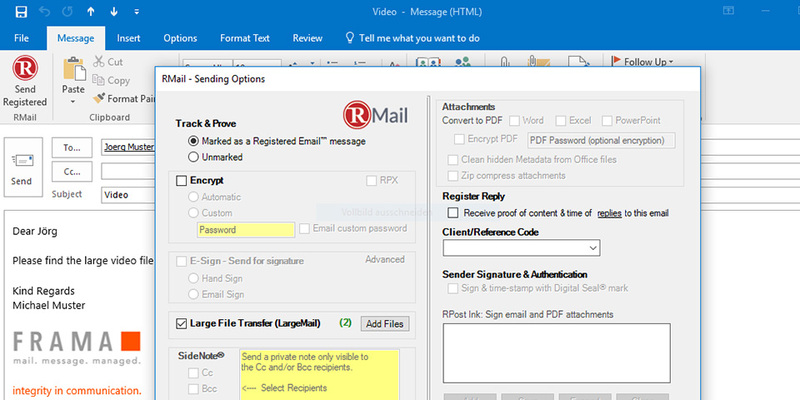 RMail enables encryption with just a mouse click and provides easy integration into existing workflows. The Registered Receipt logs the encryption method and the end-to-end encryption. No certificate exchange, no registration or similar on the recipient's end required. Works with every email client. The process is simple. For all emails that require encryption, the consistent TLS availability is tested up to the recipient. If TLS is not available through the entire delivery route, the RMail server creates a E2E 256bit AES encrypted SecurePDF and delivers this via standard email. In addition to the Auto-TLS, RMail also allows to protect information with a password. The message with all attachments is encrypted and additionally "salted" using 256-bit AES. The original email text is packed with all attachments in the original format in a PDF. The password used can now be communicated to the recipient. Only the recipient with the correct password will be able to open the email. 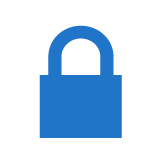 TLS available: The message is delivered encrypted to the recipient with TLS via a secure tunnel. The email will appear to the recipient as a regular email, but with an additional note regarding the secure delivery of sensitive and confidential content. TLS not available: If TLS is not available, the original email will be converted and sent as a secure, AES 256bit encrypted PDF (SecurePDF). Network or end to end encryption without caching of the data, without additional clicks, downloads or web account. Verifiable, audit-proof Registered Receipt for compliance and transmission through the unique Registered Receipt. No key exchange required. 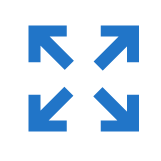 Various options for password exchange with SecurePDF selectable. The encrypted original message contains a link to a https:// web mailer. The recipient can thus respond encrypted. (Secure Reply). 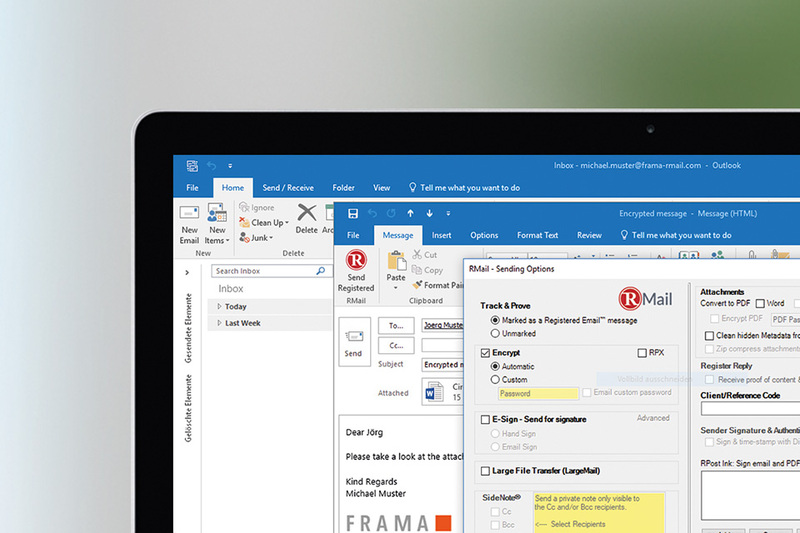 Whenever emails must be delivered provable to the recipient - whether to keep deadlines or to send important information confidentially - RMail by Frama provides the basis for doing such transactions with security and traceability. Whether via Outlook, smartphone or tablet, the unique "Registered Receipt" makes your emails verifiable and unchangeable documents with a high probative force. You are obliged to protect personal data during the transmission according to the data protection laws and notably the punishable General Data Protection Regulation (GDPR). Compliance with this regulations must be documented and actively demonstrated conformable to the GDPR (Art. 5 § 2). The "Registered Receipt" serves as a record (compliance record) and proves that you have absolutely fulfilled your obligations, should there ever be a dispute about the delivery and the content with its attachments. Not only does the "Registered Receipt" contain all the important information about the message you sent in understandable readable form, it also contains an encrypted and digitally signed snapshot of the original email. Having this information at hand, you can demonstrate what was ent at any time. The General Data Protection Regulation (GDPR) of the EU standardises the legal requirements of data protection throughout Europe. The Registered Receipt serves as a compliance record according to Article 5 § 2 of the GDPR for the transfer of personal data when using encryption (Art. 5 §1f, Art. 32). The Registered Receipt constitutes a complete receipt and is automatically sent to the sender or archived centrally at the sender. The Registered Receipt contains the information to prove the delivery, the content, the time and the compliance. The Annex "HTMLReceipt" contains the actual delivery receipt. This file consists of the original email including all attachments in encrypted and digitally signed form, the facts of the delivery (audit trail), proof of delivery, digital fingerprints and the respective time information. All information is digitally signed and therefore tamper-proof. In the event of a dispute, during which information sent via email plays a role or the compliance with the data protection guidelines is questioned, the facts about the delivery can be restored. The sender may at any time send the Registered Receipt to the other party to prove the originality of the email and compliance. The Registered Receipt contains evidence for delivery and delivery status. 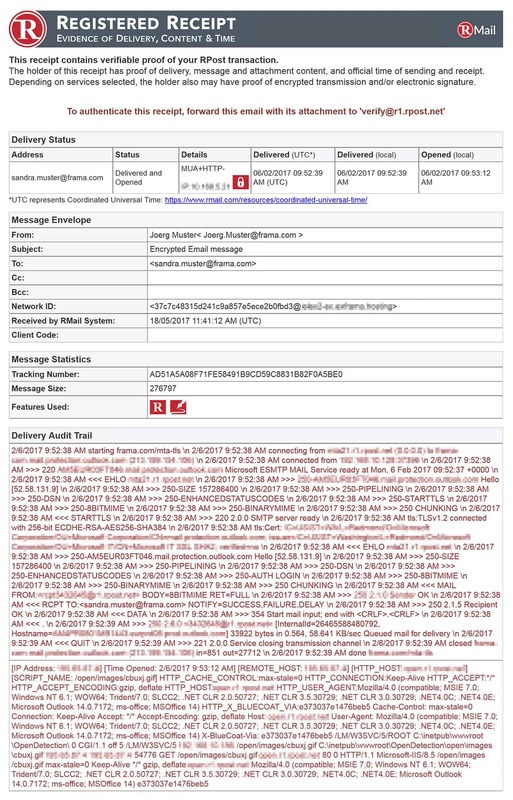 e-communications: RMail records the track & trace information of the email. This includes the server dialogs as well as further transmission data and thus demonstrates the process of the delivery. Whenever you need to send large emails or attachments, use your existing Outlook installation for this. Those who want to send large amounts of data via email often face the following problem: Most email providers only allow the transmission up to a certain file size (standard 10-25 MB). With LargeMail, you can exchange sensitive information and attachments up to a size of 1 GB simply by email. Secure, encrypted, convenient and especially with a high degree of verifiable evidence directly from your existing email system. The recipient can download the attachments via a link within 14 days (administrable). After this time window, the files are completely and securely removed from the e-communications system. The additional function LargeMail can be configured to automatically getting active for all file attachments above a certain size. You decide from case to case: Simply activate the "LargeMail" button, add the desired files and then click "send". Every system for electronic signatures must be able to reproduce the individual steps of the signing process in a verifiable way. On the one hand, this concerns the content of the documents at the time of signing and on the other hand the signing by the respective parties themselves. The patented Registered Receipt as a proof of delivery offers this possibility in order to demonstrate verifiably who signed what and when. The Digital Seal is a form of electronic signature for the sender. Digital Seal Protection ensures that the recipient can verify the integrity and the sender of the email at all times. The Digital Seal automatically adds the signature (handwritten or purely electronic), the appropriate time information and IP addresses to each page of a sent PDF attachment. The eSignOff allows the recipient to electronically sign an email as well as all pages of an accompanying attachment. When the recipient signs, all attachments are automatically converted to a PDF file. This PDF is provided with the Digital Seal and sent back to the sender. Why still print out, envelop, fax / mail and follow up contracts when it can be so fast and simple? Another option is the combination of eSignOff and Digital Seal. This creates a bilateral, legally binding contract. Party A sends the contract with eSignOff to Party B who signes it. Subsequently, party A finally signs the retrieved contract with Digital Seal. Alternatively, the contract can be sent to other parties for countersigning.